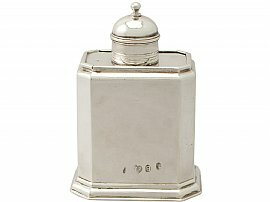 This exceptional antique George I Britannia standard* silver tea caddy has a rectangular form with cut corners onto a domed stepped foot. The surface of the tea caddy is plain and unembellished. The moulded rim to the upper portion accommodates the original detachable hallmarked, sliding plateau. This plateau incorporates a cylindrical sleeve and retains the original domed push fit cover encircled with tooled decoration. The upper portion of the cover is surmounted with a plain silver finial. NOTE: Early Georgian tea canisters/caddies in this style were fitted with a domed cover suitable for measuring tea in addition to a sliding base or top to facilitate filling. The sliding base would also enable a lead liner to be inserted, which would keep the tea fresh for longer. A tea caddy of this style is traditionally plain with moulded borders, enabling a simple crest or set of initials as embellishment. 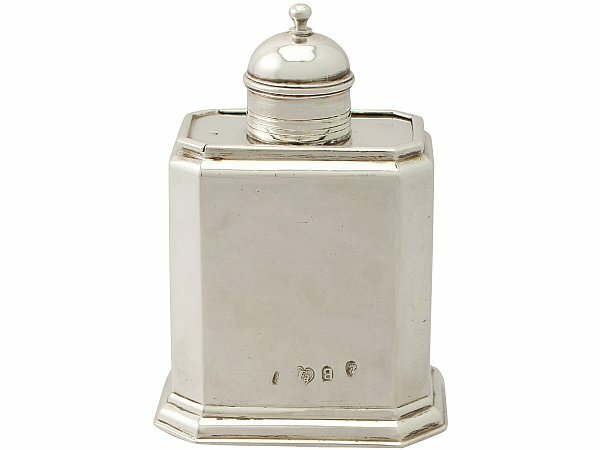 This antique tea caddy is an exceptional gauge of silver and exceptional quality for its type. The tea caddy is in exceptional presentation condition in keeping with age. The full Britannia standard hallmarks struck to the surface of the body, in addition to the part hallmarks to the upper plateau are all very clear in keeping with age; the assay mark to the full hallmarks is not clearly struck. Height to top of finial 12.2cm/4.8"